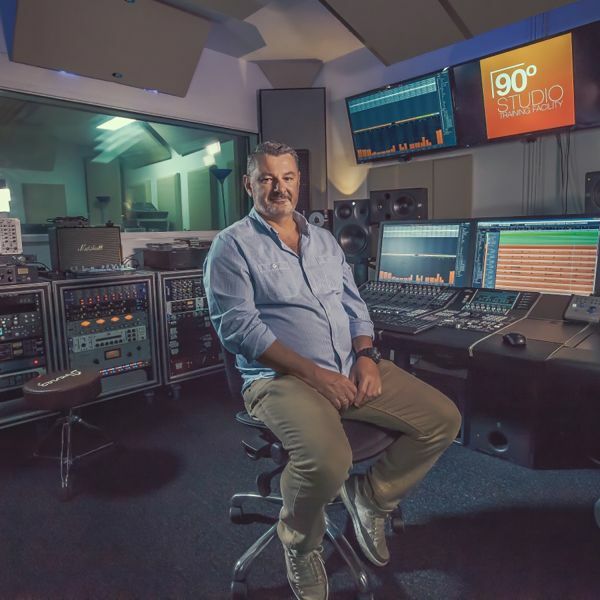 A highly acclaimed Australian music producer with more than two decades experience in the industry says undertaking postgraduate research at the University of Newcastle (UON), on the changing landscape of music production, was a life-changing experience. Prior to starting his study at UON, Rob Taylor had produced more than 75 commercial albums for artists such as internationally successful rock bands INXS, Def FX, Yothu Yindi, Screaming Jets and ARIA award-winning group The Whitlams. He’d also mixed artists such as Grinspoon, Henry Rollins, Oblivia, Veruca Salt, The Bloodhound Gang, Leonardo’s Bride, Deborah Conway and Dave Graney and the Coral Snakes. However, following more than 20 years spent producing music at a very high level in the early phase of his career, Mr Taylor said the advancement of technology and internet began to heavily affect the industry. “Technology, apps, robots and the like are changing the landscape of certain industries and specialist fields. People who previously had good career paths that they thought would last forever were finding themselves out of a job and obsolete,” Mr Taylor said. In a bold and slightly daunting change of direction Mr Taylor decided to revisit academic study, the first time since completing his undergraduate degree at UON in the early 1980s. He completed a Masters in Design Science (audio and acoustics) at the University of Sydney in 2013 and was later offered a scholarship at the University of Newcastle to pursue a PhD in Communication and Media. “Initially I couldn’t write an essay. My maths was appalling. I found it hard to sit still long enough to read what I needed to read. I found it hard to concentrate. I was in my mid 40s and I had to work extremely hard to reconfigure my brain to this new path. Because it was relatively late in my life, I had everything to lose,” Mr Taylor said. By the time he had started his PhD, Mr Taylor had noticed a distinct change in his thinking and comprehension. “The best thing was that I developed so many transferable skills that were not only applicable to my specific area, but also to life in general. It was definitely a life-changing experience on every level,” Mr Taylor said. During his time at UON, Mr Taylor also worked as a sessional academic, lecturing and tutoring for more than three years, which he found professionally and personally fulfilling. He is currently working with Toyota Financial Services (TFS) as the Internal Communications Manager after producing some internal advertisements for them. “The PhD gave me a plethora of transferable skills that could be directed and applied to many other areas. TFS certainly recognised this and gave me a shot. I absolutely love the job and the company, and I get up every morning excited about going to work,” Mr Taylor said. However, music production will always run through Mr Taylor’s veins. His boutique company SydneyMix.com.au, offers audio post-production and music composition services, giving him a continued link to audio production as a freelancer.